An hilarious and lively picture book by two of the luminaries of New Zealand's children's picture books. Mister Whistler always has a song in his head and a dance in his feet. But when he has to catch a train, he is so distracted that he loses his ticket-and has to dance his way ... read full description below. Mister Whistler always has a song in his head and a dance in his legs. But when he has to catch the train, he is so distracted he loses his ticket - and has to dance his way out of his clothes to find it! 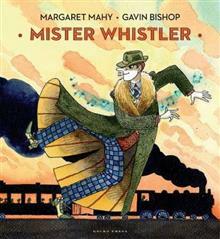 The author Margaret Mahy is one of the world's best and most famous children's authors. She was born in 1936, and wrote her first story at the age of seven. She won numerous awards for her work, including the pretigious international Hans Christian Anderson award in 2006. Margaret lived in Governor's Bay, New Zealand until her death in 2012. Gavin Bishop is equally distinguished as author and illustrator. He has exhibited nternationally, from Japan to Czechoslovakia, and was an international judge for the 2003 NOMA Concours competition for Children's Picture Book Illustration.